When you have a short-term project that requires real power, see us for a rental or lease. All of our Kubota skid-steer loaders, excavators, tractors and more are safety-inspected and ready for work. 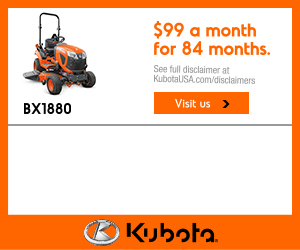 Capital City Kubota guarantees superior quality and unparalleled service on all our equipment. Contact us to confirm equipment availability and pricing, which is subject to change without notice. Note: While Capital City Kubota only offers long-term leases and rentals, visit Capital City Rental for short-term rental options.